As we begin to wind down our coverage of FoodService Director’s 2016 MenuDirections culinary conference, the editors have rounded up the takeaways—shared by experts and operators—that stuck with us even after the chairs were stacked and the signage was packed away. Stanford University shared that it replaced the spits in some of its rotisseries, traditionally used for roasting meats, with baskets for vegetables instead. The tricked-out equipment is able to roast large quantities of whole and cut-up vegetables as it spins. Students can see and smell the vegetables cooking, tempting them to put more produce on the plate, said Eric Montell, executive director of Stanford Dining, a partner in the Culinary Institute of America’s Menus of Change initiative to promote plant-based eating. Several speakers pointed out the importance of “telling the story” behind clean labels. “If you’re offering clean ingredients, make sure you tell your customers why,” said trendwatcher Maeve Webster of Menu Matters. Identify the source and tie clean ingredients into your values, she added. “Photos are the most underleveraged marketing tools in foodservice,” Webster said. If your menu does not have images, you’re losing about 50 percent of your business, she contends. Consumers want to customize the eating experience as well as their food, stressed Kelly Weikel, director of consumer insights for market researcher Technomic. Her suggestion to noncommercial operators: Look at turning your dining hall into a market, set up with stalls offering different cuisines or meal parts. This takes the customer on an eating journey, she said. And it’s a format gaining traction on the commercial side of the business, as food halls showcasing local cuisine proliferate in cities across the country. 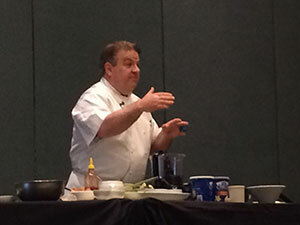 To offset a reduction in sodium, use more citrus, such as lemon zest, suggested chef Jose Zuluaga of St. Andrews Estates North senior living community in Boca Raton, Fla., during a panel featuring several members of FSD’s exclusive Chefs’ Council. Another speaker shared this seasoning secret using citrus to infuse deeper flavor: Instead of simply soaking meat in a marinade, soak sugar-cane skewers in ponzu or citrus juice, then thread them with marinated pork. As the pork cooks, the skewers impart flavor on the interior while the marinade caramelizes the exterior of the meat. The winner of the first-ever Chefs’ Council Chefs Choice Award went to Marist College for its Falafel Waffle, fusing two trends in a new format. In addition, Executive Chef Jennifer Leamons cited a red-velvet waffle, made from scratch, as the one item that could never come off her menu at Stanly Regional Medical Center in Albemarle, N.C.
Yale’s DeSantis suggested that chefs’ training in what is essentially the French style of cooking blinds some to the possibilities of scorching food. But, he notes, charring something as simple as bread can provide new flavor notes and variety in texture. Furthermore, during the event’s DineAround tour of some of Jacksonville, Fla.’s hottest restaurants, a charred cauliflower dish with curry and herb-peanut chutney was a standout, participants said. Stanford University uses a virtual pop-up program to keep chefs engaged with students and a clever social media tactic to get the word out. The school’s chefs produce 50 servings of an item and tweet out a code. The first 50 students to redeem the code get eat the special item. Yale’s chicken tenders, served every other Thursday, have built a cult following. Students can sign up to receive a tweet alert as a reminder, and the occasion even has its own website: isitchickentendersday.com. Housemade sauces satisfy customers’ desire for handcrafted ingredients, while being inexpensive to produce. They also are an easy way to offer customization; Google Food, for example, lets the employees they feed doctor their own dishes at a sauce bar. Vegetables at the center of the plate were a common theme at this year’s MenuDirections conference. Some speakers cited on-trend treatments such as applying Nashville’s hot-chicken craze to vegetables such as cauliflower. Tracey MacRae at the University of Washington declared jackfruit as a must-try ingredient. “You can make it taste like carnitas,” she said. Another MacRae must: cauliflower steaks, which hold up to strong flavors well. “If you’re not making cauliflower steaks, get on it,” she said. While it’s important to try new things to keep up with consumers’ evolving preferences, David Von Holten, a chef at University of Iowa, said it can sometimes feel like he’s pushing trends on students. It’s even more important to know your demographic and not get out too far ahead of them or they won’t eat it. Kristi Norris, food and beverage manager at Twin Lakes Terrace senior living facility in Burlington, N.C., pointed to a similar need for balance. She has to accommodate people ages 55 to 105 in her operation. They’re all so different, and don’t at all want the same things. Bringing that divide together is a constant struggle, she said, and she often feels like she has two different foodservice programs.